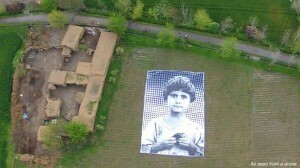 Artists install massive poster of child’s face in Pakistan field to shame drone operators | The Raw Story. The bad news is, the media, our “leaders” and we ourselves, tend toward gross generalizations, which is often oversimplification and usually inaccurate. We refer to any person or attitude that originates from Russia as if that thing or person represents “Russia” itself, whereas it might represent only one person in Russia. We blame everything Russian on Vladamir Putin as if he is the only person in Russia and is responsible for everything that happens there. He is a figurehead. We label anything that comes from any resident of the USA as “America” in general or we blame it on the U.S. President. Any policy that has to do with America, we pin on Obama, as if he is in charge of everything in the USA, as if he is personally omniscient, omnipresent and omnipotent. He is a figurehead. And the same applies to all countries and their leaders. Obama becomes the scapegoat of all things American. The Prime Minister becomes the scapegoat of all things British, and so on… Syria, the Ukraine, Iran, China, Israel. But are you “America”? Am I? Is Obama “America”? is Obama’s administration “Obama” or “America”? Do you want war? Does Obama? Do you personally profit from war being waged in your name? Do you celebrate the idea of death and destruction coming to your own country, town, home? Do you want to be blamed for the actions of the leaders of the government of the country you happen to live in? Do you want to be bombed because you live in a country that is perceived as a rogue state that betrays other countries – and its own people? And if not you, dear “America”, then who? Who exactly wants war and profits from war? Do you know who beats the drums of war for personal profit? “America” is a very big place with a lot of people. Russia as well. China is even bigger than either the USA or Russia. It’s not fair waging a war on the people of a country just because we all have a few men behind the scenes pulling the strings who are ambitious, rude or aggressive and want to control the world. Let’s get more specific and place the blame and credit where they belong. Who exactly is it who wants war, death and destruction? And what can we do about these very naughty people and their dastardly plans for the world and its population? I suggest we find out exactly who is behind all the corruption we see in the world. Who loves money more than life itself? Who justifies war as “tragic but necessary”? Who pits people against one another? Who stirs trouble among the nations, between the races and social groups? Who is creating animosity between the civilian people and the governments that are supposed to be representing them? Who has altered our country’s legal structure so that it is now a corporation rather than a government of, for and by the people? Who has, for all practical purposes been operating as self-appointed monarchs, outside the jurisdiction of election box, to make important decisions and dictate them to the people in the USA, as well as the standing governments? Who can afford to buy corporations and governments? Who can afford to hire assassins to kill their enemies? Who can afford to hire public relations firms to whitewash their evil past? Who dares to harm others, steal, lie, kill? I want to own nothing and control everything. GMO, Monsanto, Solutions, What have they done? via Vladimir Putin: Russia Must Protect Its Citizens from GMOs – Sustainable Pulse. For a second time, Icelanders rejected a scheme to “repay” – as Reuters deemed it – $5 billion to banks in Britain and the Netherlands following the engineered looting and crash of the Kaupthing, Landsbanki and Glitnir banks. The crash all but destroyed Iceland’s economy and swindled thousands of European bank customers. 60 percent of voters opposed the shakedown while 40 percent said the country should give in to bankster intimidation. Iceland did something unthinkable in the United States – it went after the banksters and their minions. In early March, Sigurdur Einarsson, former chairman of the defunct Icelandic bank Kaupthing, was arrested in London. The the Special Prosecutor’s Office in Reykjavik ordered the police to raid the homes of other bank principals. Ivar Gundjonson of Iceland’s failed Landsbanki bank was also arrested. Predictably, the corporate media has under-reported Iceland’s efforts to arrest and prosecute bankers. » Iceland Rejects Bankster Shakedown.